Heat oven to 425°F. Spray 13x9-inch pan with cooking spray. Unroll dough in pan. Starting at center, press over bottom and 1/2 inch up sides of pan. Bake 8 minutes. Meanwhile, in 10-inch skillet, heat oil over medium-high heat. Add bell peppers and garlic; cook 3 to 5 minutes, stirring constantly, until bell peppers are crisp-tender. 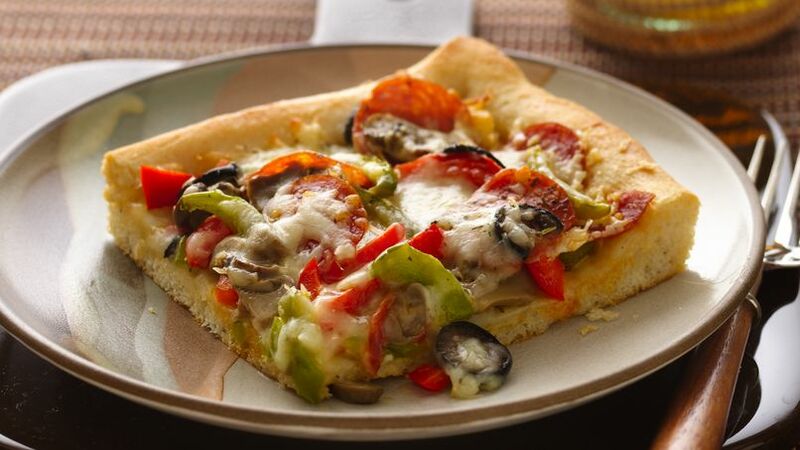 Layer bell pepper mixture, mushrooms, Italian seasoning, pepperoni and olives over partially baked crust. Sprinkle with cheeses. Bake 12 to 14 minutes or until crust is golden brown around edges and cheese is melted and light golden brown. Let stand about 5 minutes before serving.